Growing, Selling and Propagating non Patented Heuchera, also known as Coral Bells. Things to Do in and Around Cleveland, Ohio and Northeast Ohio. Thank you Tim and Patty! A Very Simple Landscape Design Idea. The Ten Minute Plant Show. Heeling in Japanese Maple Trees, Rooted Cuttings and other Plants. The One Gallon Plant Conspiracy. Book Review-Garden-pedia by Pamela Bennett and Maria Zampini. We’re Giving Away a Free Gardening Gift Basket! Gold Flame Spirea, Growing, Selling and Propagating this Awesome Plant. Pruning plants in the nursery before winter. How to Winterize Sprinklers, Irrigation Lines. Moving a Large Laceleaf, Weeping Japanese Maple Tree. Unrooted Hardwood Cuttings for Sale. Variegated Weigela, an Excellent Plant to Grow and Sell from Home. Backyard Nursery Tools of the Trade, Things to turn you into a successful grower. Exactly what is and Where Do I Find Coarse Sand for Rooting Cuttings? Huge Plant Sale this Weekend! Can Planting More Trees Prolong Your Life? Are Birds Eating All of Your Fruit? Trellis Your Green Beans! 7 “How To” tips. Which Wheelbarrow Should I Buy? Know How to Identify Poison Ivy Before It’s Too Late! One Finger Pruning of Weeping Cherries, Japanese Maples and other Grafted Plants. Plant Sales: Plant Sizes, Plant Prices and the Value of the Plants We Sell. How Much is One Rooted Cutting Worth? Easy Summertime Plant Propagation Techniques that You Can Do at Home. Electric Wheelbarrow Review by Mike McGroarty. Look who came to visit me today at Mike’s Backyard Nursery! Why Rhododendrons Fail to Grow and Two Super Hardy Rhododendrons for Cold Climates. Backyard Nursery Tools of the Trade. Patented Plants and Plants with Registered trademarks and the Tale of White Fountain Weeping Cherry Trees. How to Get Rid of Wild Morning Glory. Nursery Supplies for Our Backyard Growers. Growing Pink Dogwood from Seed. 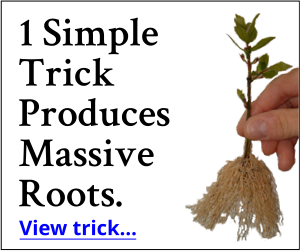 How to Root Purple Sandcherry, prunus cistena from Hardwood Cuttings. Which Plants Are The Most Deer Resistant? Top Secret Irrigation Tips for Your Yard. Mike and Duston McGroarty are Giving Away the Farm! A Tip for Selling the Plants that You Grow. Lawn Installation. Hand Seeding, Hydro Seeding or Sod? Which is better? Mike and Duston McGroarty Offer Live Training for Small Business Owners. Winter Time Plant Propagation Techniques. Paying off all of your debts is a life changing, liberating experience. How to Propagate Grapes from Hardwood Cuttings. Protecting Your Plants from Mice and other Rodents During Winter. Happy Thanksgiving from all of us here at Mike’s Backyard Nursery. The Consumers Guide to Caring for and Planting a Live Balled in Burlap Christmas Tree. How to Grow Roses from Cuttings. B&B, Balled in Burlap, Tree Digging Tips. Growing, Propagating and Selling Canadian Hemlock Tsuga canadensis. This is the Way that Crazy People Prune Plants. Using the Mantis Tiller to Prepare a Landscape Planting Bed. Plants in Pots Verses Plants in Beds or in the Field. Nikko Blue Hydrangea. Growing, Propagating and Making them Bloom. Mike McGroarty Gets Slammed by a Subscriber. How Can You Start a Backyard Nursery with this Kind of Help? Stay at Home, Home Schooling Mom, Loves Growing Plants at Home for Extra Income. How do you propagate Dianthus, Carnation or Sweet William, sometimes known as Pink? Wheelbarrow Review, Which Wheelbarrow Should You or I Buy? How to Sell the Plants that You Grow. Growing, Propagating and Caring for Exbury Deciduous Azaleas. Snow Damaged, Hoop House, Greenhouse, High Tunnel. How can I use free wood chips in my garden? How to Propagate Fragrant Viburnum. How to Ruin a Japanese Maple Tree. Preventing a Back Injury While Gardening. Heirloom Seeds, are they Really Better? Grafting Japanese Maple Trees Made Easy! How to Graft Japanese Maple Trees. Selecting and Caring for a Live Christmas Tree. Why do plants have to be inspected? Mike McGroarty on the Economy. What is Mike McGroarty Reading? What has Pam been up to? The Joy of Being a Gardener. What are we doing to our trees? Are your plants safe? Is it too warm too soon. Zoysia Grass. Is it a good thing or not? Digging My Well… My Plants Need Water! Me, the Grandkids, and the Train! Mike McGroarty’s Backyard Growing System! Your Burning Bush Won’t Turn Red? How Should I Prune My Crepe Myrtle?